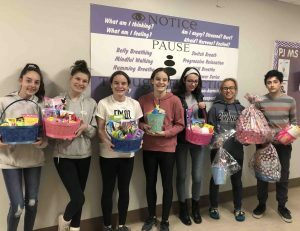 The freshman class at Earl L. Vandermeulen High School collected Easter candy, books and toys to create baskets for children whose families are enduring financial hardships. They also filled more than 100 plastic eggs with goodies for an egg hunt at a local shelter. “The kids were so excited to help those in need,” said Christina Carlson, freshman class co-adviser along with Melissa Zinger, who both encouraged the entire class to share in the project by bringing the holiday items to teacher Jesse Rosen’s social studies classroom. Photo caption: From left, Earl L. Vandermeulen High School freshmen Cami Spiller, Emily Hearney, Kate Carlson, Alex Carlson, Heather Quiggle, Kasumi Layne-Stasik and Stefano Rabeno.